Guiseley captain Danny Lowe: Helped select the team. Managerless Guiseley left Leyton Orient empty handed despite a promising start. After taking the lead, Guiseley conceded two penalties just before half-time and went on to concede twice more in the second-half. The team had been selected by members of the coaching staff and captain Danny Lowe following the midweek dismissal of Adam Lockwood and assistant Dave Penney. 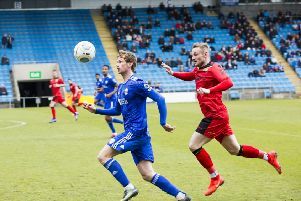 The game plan of the stand-in ‘committee’ proved effective for large parts of the first-half and after the defeat Lowe said: “The attitude of the lads was top-class. We had that chance when we went a goal up but to concede two penalties in such a quick fashion affected us. Orient almost took an early lead when Guiseley goalkeeper Joe Green had a clearance blocked by Macauley Bonne and the ball trickled across the face of goal. Guiseley’s Lee Molyneux produced a fine effort from 25 yards before they broke forward and a fine well-worked move ended up with Kayode Odejayi having a tap-in for the Lions’ first away goal of the season. The hosts, though, were back level moments later when a penalty was awarded for hands and Bonne made no mistake from the spot. Then, with the next attack, Orient had another penalty when David Mooney went down easily under a challenge from Marcus Williams and Bonne went the same way with his spot-kick, which had too much power and went in. The second half began like the first with Orient having chances but nothing clear cut. That changed when Matt Harrold scored with a header just a minute after coming on for his debut. Bonne grabbed his hat-trick when a long ball over the top fell perfectly for him to run onto and score. Guiseley are hopeful they will be naming their new manager before the game against Eastleigh on Saturday. Leyton Orient: Grainger; Caprice, Coulson, Elokobi, Widdowson; Dayton, Clay, Ochieng (Sendles-White 80), McAnuff, Mooney (Harrold 60) Bonne (Koroma 83). Unused substitutes: Sargeant, Judd. Guiseley: Green, Williams, Lowe, Palmer, East, Molyneux, Purver, Rooney (Thompson 65) Hatfield, Hurst, Odejayi (Mulhern 63). Unused substitutes: Brown, Lawlor, Atkinson.